Published November 7, 2011 By Anna T. This post may contain affiliate links. Regardless, I only recommend sites I've researched and/or used and trust. Do you like earning extra cash for doing easy things? I definitely do. And short task sites are a good way to do this. For example, I started using mTurk several years ago and logged on regulary just to get some Amazon money built up because the work is, for the most part, so easy. A lot of it doesn't pay well, but you'll occasionally come across a few gems that do in there. It's certainly worth signing up to see what's available from time to time to earn a little extra. There are a lot of other short task sites out there in addition to mTurk, but I've never really reviewed too many others so I decided to put together a small list of short task sites you can use for extra cash. The work will vary from site to site. For instance, you might be writing reviews, leaving comments, doing work at home data entry, categorizing items, or even liking a Facebook page. That's one of the things I love so much about these sites — you never know what will be listed that you can do. #1 – Various reward sites – It's also worth noting that many of the popular reward sites you use to earn money for searching, shopping, coupons, etc. do have short tasks available you can complete to earn even more on these sites. Some that have the short tasks are Inbox Dollars and Fusion Cash. #2 – Amazon mTurk – Read Review – Sign up as a worker to start taking HITS (Human Intelligence Tasks). You can request either actual cash money or funds added to your Amazon account to use for shopping. The payout threshold is only $1 if you're requesting Amazon money. If you ask for direct deposit to your bank account, you have to have at least $10 to request payout. #3 – OneSpace– Read Review – Another short task site where it's possible to get paid a few times a week. The work you'll find here is similar to other stuff posted at Mturk — transcription, tagging, web categorization, and so forth. #4 – Microworkers– The jobs on Microworkers are especially easy. I see a lot of “like me on Facebook” and “Stumble this article on Stumble Upon” listed here. Unfortunately, they only pay you here with Moneybookers or AlertPay — no Paypal. I am not too familiar with either Moneybookers or AlertPay, but from what I can tell they are similar to Paypal. #5 – ClickWorker – Read ClickWorker Review – They pay once a week and will send you payment even if you just have one cent in your account. They also hire worldwide. Some of the work you can choose from includes copywriting, researching, translating, writing, and also easier tasks. #6 – RapidWorkers – This site only has a $4 minimum payout. To me it looks a lot like Microworkers! I'm curious if the same people run these. This one will pay you with Paypal, but they say it takes 30 days to process your payment. Also, there are five percent fees for withdrawing your funds. #7 – Figure Eight – Read Figure Eight Review – This is a newer one I found. Do all kinds of things for quick cash including categorize social media, moderate content, transcribe audio, and more. Pay amount and frequency aren't mentioned, but it is pay per task. 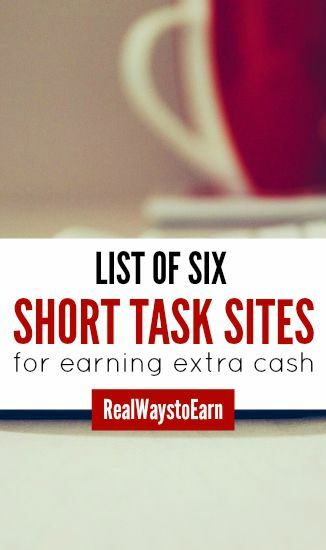 Hopefully that list will help you if you are looking to expand your options for extra cash on short task sites. Please keep in mind that some of the jobs posted on these sites are posted by individuals, not necessarily the people who run the sites. For this reason, I urge you to use caution before accepting any tasks that you feel something isn't right about. Hi Anthony, Unfortunately I’m not sure what you can do if Clickworker isn’t working for you. If you’re just having technical trouble with their website, you may want to contact them to let them know what is going on or perhaps first try it with a different browser and see if it will load? All we have been open for 3 years now… we have many jobs to be done online! Hello Anna, first I want to thank you for all of your posts! Recently I have started with Mturk. I was just wondering if you had any recent updates on any of these other task sites. I really enjoy Mturk and was just looking to add other “eggs” to my basket!! Thanks for any response you may have! No problem! Apart from Mturk, lots of people are still having good luck using ClickWorker. No one ever says much about Rapid Workers so I’m not sure on that one. I did have someone mention on my Facebook page the other day that he was making decent money on the side with Microworkers, but honestly that kind of surprised me because it seems most people don’t like using that site. Thank you very much, I will check those out also. I wanted to mention a brand new site called http://gigworks.net we are much like other sites like fiverr and you can get paid via paypal for completing each job (gig). More payment gateways are in the works, and the site is new. Try it out it is free to post and search. Great list, Anna. There are some places where I haven’t heard of so I definitely plan on checking those out! I just wante to say how much I love your website…I am so glad I found it! It is very helpful and helps me to weed out which “work from home” websites are scams. Keep up the great work! I use mircoworkers the most out of all these website’s. I would like to know how often do people use the other sites? There are a total of ten sites on this page. If my strategy was to make 25 cents a day on each of the websites. That would be a total of 75 extra dollars a month. Does anyone have a similar or better strategy that they use. Katrena, the only one I’ve used is MTurk. I search for tasks in the 0.50 range. At that level, I have found quite a few surveys for people doing psychological or sociological research. I enjoy those a lot- they are usually straight to the point, don’t take very long by design, and I like helping someone get the data they need. Katrena, I honestly believe that earning an extra $75 per month is possible from using these sites. In fact, I’m sure you could earn even more than that if you focused on them a lot. Your hourly rate, if you figured it up, would fluctuate depending on what kind of tasks you were doing and I would think that more often than not it would be on the low end. BUT money is money and this is an easy way to get it from home.